Things changed only in 2015. The way the optimists such as me read it, two things broke the logjam. First was the dramatic fall in the cost of wind and solar energy. By 2015, the IPCC estimate of the net cash cost of a clean energy transition had fallen to as close to zero as made no difference. That wasn’t counting the massive health costs of air pollution, mostly from fossil fuels – a highly visible and political problem in China. With a nil or negative net cost domestically, the international free rider problem melted away. Second, the diplomats ditched the top-down approach of Kyoto, seeking to allocate emissions cuts and by implication a carbon budget fairly among the world’s states. Technocracy was replaced by flower power: let everybody do their own thing. Unsurprisingly, the world’s governments could readily sign up to this. What was left was a clear common goal – or rather, two: holding warming to 2 degrees C, and if possible to 1.5 degrees. Plus massive paperwork: public national plans filed with the UN and reviewed by peers in the treaty system, and by scientific and public opinion outside it. That was the epochal Paris Agreement of December 2015. It has held up remarkably well to the shock of the withdrawal by the know-nothing Donald Trump, who could only justify the absurd step by flatly lying about the treaty’s burdens on the USA. Even Putin and Erdoğan, who don’t plan to do anything concrete to comply, have deemed it politic to stay in rather than risk joining Trump in the pariah club. On the contrary, flower power keeps scoring wins: the number of coal plants keeps falling in developed countries, and the tally of those under construction in developing ones has dropped even more sharply; banks and insurance companies are tiptoeing away from risky lending to fossil fuels; emissions plateaued for three years, though they ticked up in 2017; and wind, solar and electric cars keep booming as their price drops. Nuclear, especially next-generation nuclear, has tremendous potential to be part of the solution to climate change. The dangers of fossil fuels are staring us in the face. So for us to say we won’t use all the tools [such as nuclear energy] to solve the problem is crazy. At this stage, the position is harmless crankiness. Nuclear reactors, with their negative learning curve, regular delays, uncertainty, and long-tail risks drove off almost all private investors decades ago. There is no good reason to think new nuclear is essential or even useful to the energy transition. “Next-generation nuclear” doesn’t exist. The economics of the nuclear reactors that can be built, poor as they are, depend on use as “baseload”, a concept that cheap but variable wind and solar as primary generators have rendered obsolete. What these need is flexible despatchable backup, which can be supplied far more cheaply by storage, gas turbines, more trade (eg with Quebec or Norway), or paid-for demand response. On energy blogs like MIT Technology Review or GTM you can find a vociferous band of loyal pro-nuclear commentators, but they do not represent anybody with power or money. 1. Scientists tell political leaders the facts and the dire probable consequences of business-as-usual. 2. Political leaders listen, repent and take the needed action. It doesn’t really ever work that way. It is implicit in the Jonah story that the repentance of Nineveh is an absurd counterfactual. In reality, the Israelites had to wait till Cyrus the Mede took Babylon to be saved from captivity and occupation; and Cyrus’ policy was driven by calculated raison d’état, not a religious conversion. Anybody who works on public policy knows that identifying sound policies (to niggle, the Pareto onion surface of quasi-optimal policies from a chosen starting-point) is just the first step. Getting something done is politics: persuasion, mobilisation, fundraising, horsetrading on platforms, fighting opposition, winning elections, crafting budgets and legislation. The Paris Agreement was a triumph of mucky sausage-making politics, not Platonic rational policymaking. We aren’t in a very good place today, and would be in a much better one if our Nineveh had repented in 1988 when Jonah-Hansen first preached the message. But our prospects are a hell of a lot better than five or ten years ago. And much of this is thanks to Hansen and other prophets. Would the Paris Agreement have been as strong as it is, and as resilient to shocks afterwards, without the energy of thousands of activists camped in the streets of the city while the diplomats negotiated behind closed but semi-transparent doors? Would it have been adopted without the vision and skill of Christina Figueres, Laurent Fabius, Todd Stern, Tony deBrum, and many others? Another group of prophets deserves to be honoured. (I am using the term in the Biblical sense: one who is morally driven to call their contemporaries to action by example, not a mere predictor of the future like an augur, haruspex or stock tipster.) I cited earlier the fall in the cost of renewables as one key element in making possible the Paris Agreement and the energy transition it requires. This did not happen by accident or the magic of the free market. The slope of the learning curves of technologies like wind and solar power and batteries may be exogenous. But it’s a relationship between cost and volume, and depends on growth in volume and an appropriate level of R&D. Until wind and solar broke through cost parity with coal, oil and gas a few years ago, progress down the leaning curve depended on subsidised deployment and research. Car batteries are not quite there yet. Researchers on solar: Becquerel, Willoughby Smith, Fritts, Einstein, Czochralski, the Bell Labs team of Chapin, Fuller, and Pearson. On wind: Poul La Cour and Johannes Juul in Denmark. On batteries: John Goodenough, who coming up to his 96th birthday still unprized in Stockholm, has just announced a research breakthrough on a high-density solid-state lithium battery. Politicians and bureaucrats: NASA in the 1960s, MITI in the 1970s; Hans-Josef Fell and Hermann Scheer, leaders of the Energiewende in Germany and instigators of the 2000 Renewable Energy Act (EEG); Jerry Brown of California; Barack Obama (through targeted ARRA funding and the bilateral deal with China that made Paris possible). Businessmen: Tokuji Hayakawa of Sharp in Japan; Elon Musk of Tesla; Wang Chuanfu of BYD. This is an incomplete list, and no doubt unfair from my lack of knowledge. But it is near-certain that without these 18, and the then leaders of MITI and NASA, renewable energy and electric transport would not be where they are today. The challenge also induced a lot of effort on enhanced geothermal, wave energy, OTEC, power kites, fuel cell cars, and other ideas that have not so far panned out. Nobody knows in advance which ideas will work out, and the failures also deserve their share of praise. 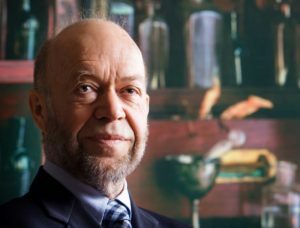 James Hansen should accept that he is a member of a very select company, and accept the thanks of all of us in Nineveh. 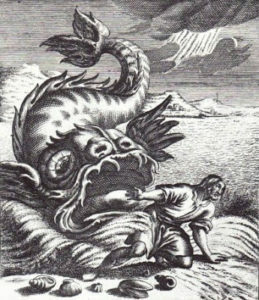 The Book of Jonah describes the creature that snacked on the conscript prophet straightforwardly as a fish, Hebrew dag. The Israelites were landlubbers and their marine biology did not go much further than the distinction between OK scaly fish and banned other seafood. The book is cited by Jesus in Matthew 12:40, where the word becomes the Septuagint’s ketos, big fish, sea-monster, whale. Mackerel can’t eat prophets, and they had never heard of piranhas, so the bigness was a sensible gloss. Jerome translated ketos in the Vulgate as cetus, later identified with whales, as in Linnaeus’ cetaceans. My woodcut shows (?) a three-eyed fish not a whale, so I infer it is from a Protestant translation (take that ignorant croppies). Identifiably female commenters are rare enough here to deserve a special welcome. keep them coming! Feel free to interrupt! The RBC is mercifully troll-free and civil. Jonah is a very quick read, at four short chapters. Syukuo Manabe deserves a mention – 50 years ago he and Richard Wetherald published the first "climate model" for the earth's atmosphere that covered conduction and radiation. In videos of Hansen before the Senate, Manabe is visible seated near Hansen. In any other area of physics, Manabe might be in line for a Nobel Prize recognizing a major groundbreaking contribution, but too many see climate science as "overly political". I left out the other scientists, partly from sheer ignorance as to their names. Hansen became the public face of a scientific community that was still small at the time. Leonidas had 300 hoplites at Thermopylae, Travis about 250 riflemen at the Alamo. Dowding had 1,103 fighter pilots at the start of the Battle of Britain. These are the sort of numbers we are looking at for the good guys in the early climate battle. I am afraid Hansen's pessimism may be right. If you overlay population maps with maps of the parts of the world where people will be unable to survive without air conditioning (sustained wet bulb temps of 30C and up), it's a whole lot of people, many of them with serious firepower. Great post, as is usually the case. So, any good book recommendations on the history of renewable power development and implementation? John Perlin's Let it Shine is the standard history of solar power, especially good on the long backstory. I don't know about wind. I've not read it, but Craig Morris has written a useful-sounding history of the Energiewende in Germany. Thanks – ordered the book!